Similar Species: Shiny green bees in this genus (Osmia) may be mistaken for some bees in the Agapostemon or Augochlora genus (both in the sweat bee family (Halictidae). Blue to purple metallic Osmia bees could be mistaken for bees in the Andrenidae family. 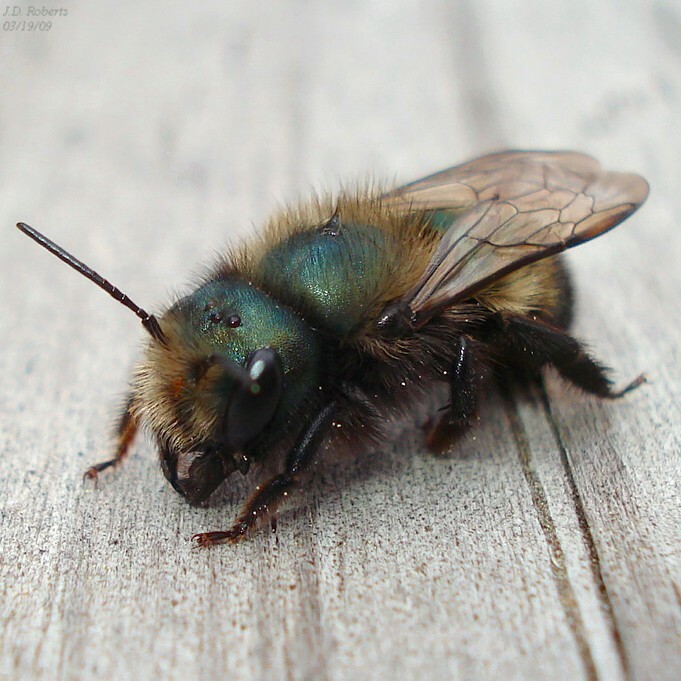 However, Osmia bees are generally larger and carry pollen on the underside of their abdomens instead of their legs, a feature shared among the Megachilidae (leaf cutter sand mason bee) family. Range: Found across Canada, from British Columbia to Quebec. Habitat: Blue orchard bees occur where there is a supply of nectar- and pollen-rich blooms and suitable nesting habitat. These cavity-nesting bees generally nest above ground. They build nests in long, narrow spaces like hollowed plant stems, tunnels excavated by beetles in logs or snags and in spaces between rocks. These nesting preferences are reflected in man-made nest nesting blocks, made by drilling tunnels in a block of wood or gathering a bunch of hollow bamboo sticks. These artificial nesting sites are often used to encourage mason bees to nest, often on farms or fruit tree orchards. Setting up these artificial nesting sites is also a popular backyard project among pollinator enthusiasts. Diet: Nectar and pollen. These bees are important fruit tree pollinators. These are solitary nesting bees that are especially active in early spring. They nest alone in long, narrow spaces like hollow plant stems. They lay several eggs, each in its own chamber, with walls made from mud or chewed leaves. The two main threats to most pollinators include habitat loss and pesticide use. Although the blue orchard bee is a fairly common species and not currently at risk, you can plant native plants, such as cherry, plum and apple trees in your garden to help support mason bees and other pollinators. You can also avoid using synthetic pesticides in on your garden and lawn. For a special project, you could create an artificial nesting block, made by drilling tunnels in a block of wood or gathering a bunch of hollow bamboo sticks.